The Professional Trader Masters Program starts with 16 one-hour one-on-one Foundation Meetings over the Internet with Jeff. These exciting video meetings are recorded so you can review what has been covered as often as you want. The cost of the 48-session Masters Program is $9,000, which can be paid $4,000 to start followed by a second installment of $3,000 in 30 days and a third and final installment of $2,000 in 60 days. After the initial 48 sessions, I am available as a mentor on an hourly basis with the trader buying blocks of 5 hours for $1,500. Mentoring charges are payable in advance and may be paid by check, bank wire or by Visa, MasterCard or Discover through PayPal, below. 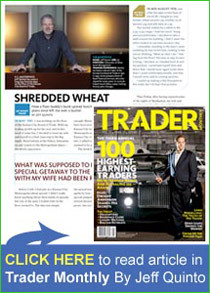 Become part of the Professional Trader Masters Program community of traders – E-mail me or call me at +1-312-685-5333.